Hi and welcome to Cakeday. Doesn’t that sound a million times better than Monday? This is quite possibly the best recipe I have ever created on the entire blog. I know that is a crazy thing to say but it may just be true. It’s definitely in the top 10 recipes and probably in the top 5 and definitely a contender for #1. YOU MUST MAKE THIS CAKE. I don’t care if you’re gluten-free or you eat all of the gluten—all of the time. This cake is about to be your best friend. You’re going to start having dreams about it and when zucchini season is over you’re going to cryyyy. But don’t worry because you can always switch up the zucchini for carrots. In fact, this recipe is based off my most recent carrot cake recipe that was adapted from my first carrot cake recipe, both of which I adore. And it’s totally going to bathe in cream cheese frosting, because sometimes you just need cream cheese frosting drenched over a cake. Also. No mixer required! You’re going to whip this right in your blender. Because it’s easier and creamier and oh my god so good. I realize I’m slightly excited about this cake, but you will soon see why. photography side note: Do not even ask how I managed to get this photo. You should see the other 40 before this one. The frosting is quite thick and does not easily pour out of the creamer spout, making this pour shot nearly impossible. I used my remote shutter with my tripod set up and had the shutter speed cranked high. I also pre-focused the camera right in the spot I was pouring in hopes it would get a clear shot of the pour. Somehow, 1 out of 40 worked! Just keeping it real. The funny thing about photographing cakes is that you basically have to photograph the entire thing and then HOPE it tastes edible [preferably better than edible] so you can post the recipe without having to remake it. I totally lucked out here because this would have been a pain in the buttocks to remake and photograph. But holy moly the anticipation before that first bite! I could have died. I’m not even going to try and describe the texture to you because I think you can tell from the photos. And it’s got this dense but light thing going on that is confusing and amazing and too hard to describe. 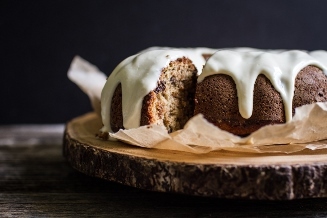 Even more awesome news is that you only need oat flour + almond flour to make this cake! Ahh, simplicity. Zucchini baked goods will always hold a special place for me as I’ve explained on the blog before. Every year growing up my mom and I would bake loaf after loaf of zucchini bread as my dad would pull the biggest zucchinis you’ve ever seen from our garden and pile them up on the back step. By the end of the season our loaves were filled with chocolate chips [because, why not?] which were obviously my favorite. So each year I feel the need to come up with a fun new zucchini baked good and this year I think I’ll stop right here. Make this if you know what’s good for you. Place your grated zucchini evenly on a kitchen towel with another on top. Press down gently and let the moisture absorb into the towel. Keep covered. Thoroughly grease your bundt pan [I used a 9 3/4-inch by 3 1/3-inch bundt pan] or 2, 8-inch round pans on all sides with butter or coconut oil. Lightly flour and knock around to fully coat the pan. Flip over and knock on the pan to release excess flour. In a large bowl stir together the flours, sugar, baking powder, cinnamon, and salt. In another bowl whisk the eggs. Then whisk in the milk, yogurt, honey, and vanilla. Whisk in the oil until fully combined. Pour the wet into the dry and whisk until just incorporated [when you no longer see dry flour]. Fold in the grated zucchini and chocolate chips until evenly distributed. Pour into your pan and level. Place in the oven to bake for 42-52 minutes, or until the top is cracked and golden brown and a toothpick comes out nearly clean. You don’t want it gooey but just slightly moist. Place the pan on a cooling rack for about 20-30 minutes. Carefully slide a thin spatula or butter knife around the center ring and edges. Flip over bracing with your hand and allow to cool fully on the rack. Once cooled, place all frosting ingredients in your blender [starting with the lesser amount of milk and honey]. Blend until just fully creamy and add more milk for a thinner consistency or honey for sweetness. It will thicken a bit as it sits. Pour over the cake and store any excess covered in the fridge. Serve cake and store leftovers fully covered in the fridge. Best eaten at room temperature or warmed for a few seconds out of the fridge. Notes: If you can’t find full fat Greek yogurt, low-fat and probably even non-fat will work okay. Plain whole milk yogurt can most likely be used but if it’s runny reduce to 3T. Flours: Sub flours at your own risk. I would not attempt subbing the eggs with flax-eggs. I’m on vacation this week so if your comment or email goes unanswered I’ll get to it when I return! Thank you!